How Long Does It Take Muscle to Grow After Working Out? Best Home Gym Equipment Reviews How Long Does It Take Muscle to Grow After Working Out? Many people who first step foot into a gym enter with the goal of putting on some size. Whether it’s looking better naked, going up a shirt size or just having a set of python’s hanging by their sides, many fitness enthusiasts’ goal is to get big. Of course, people want results as quickly as possible, but how quickly are results achievable? Of course, the IFBB bodybuilding pros competing for Mr. and Ms. Universe didn’t get there overnight. Muscle building has several different factors involved, and occurs every body differently. So, How Long Until I’m Ripped? Here are the main factors in muscle building and why paying attention to them will get you on the right track to putting some real muscle on your body. If you’re taking whey protein and creatine, but sitting on your couch all day, you’re not going to gain any muscle. Muscle gain happens through intense resistance training (60%-80% 1RM). Lifting weights and other resistance training creates several microscopic tears in the muscle that are rebuilt by amino acids. Without training, you might gain weight, but it’s not going to be the kind of weight you want to gain. Gaining muscle requires a caloric surplus, a high amount protein and a moderate amount of carbs and fats. If you train hard, but are taking in fewer calories than you need, you’ll simply lose weight or stay at the same weight. You can get stronger and more toned this way, but you can’t get big. Getting enough protein is paramount because protein is what is going to rebuild your broken down muscle fibers after a workout. No protein = no muscle growth. Carbohydrates (especially after a workout) help to shuttle nutrients to the muscles and act as a primary energy source. Recovery is probably the most underrated and least talked about aspects of muscle building. Recovery is extremely important because your muscles recover – and thus, grow – while you’re at rest. If you’ve heard about how important sleep is for bodybuilders, that’s why. If you’re constantly exercising and not getting enough rest, you’re not giving your muscles a chance to repair those microtears; plus, you’ll be constantly burning the calories you need to grow. Different bodies adapt to weight training differently, and need different things for muscle growth. There are 3 distinct body types that require different things to put on some lean muscle mass. People who fall under the ectomorph category have a natural predisposition of putting on body fat easily and losing it slowly. Muscle building generally comes quickly to endomorphs, but it’s important to keep calorie count under control. While it’s easy for endomorphs to put on muscle, it’s also easy to pack on weight – and it’s hard for endomorphs to lose that body fat. If you’re an endomorph you still have to stay at a caloric surplus to gain weight, but not as much as the other body types. Endomorphs will typically see muscle gain the fastest if lean. 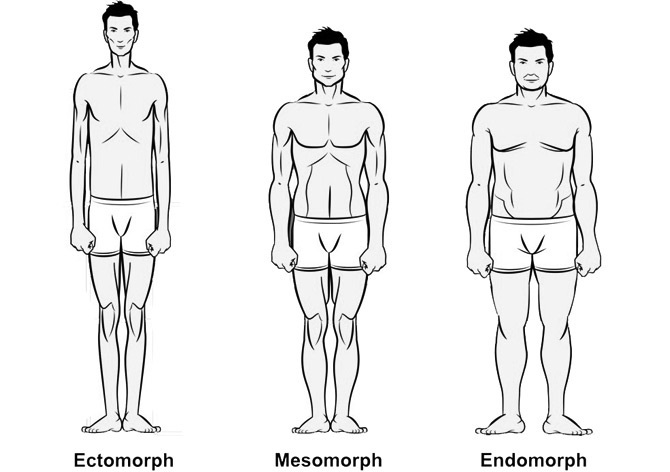 A mesomorph body type is the most conducive to muscle growth. Mesomorphs generally have a developed musculature and put muscle on easily, but have a fast enough metabolism to stay lean naturally. To grow, you’ll need more calories than an endomorph would, but you still want to watch your calorie count to avoid storing the extra calories as fat. Mesomorphs will see muscle growth quickly, but not as quickly as endomorphs who remain lean. Ectomorphs have it the hardest in the battle to build muscle. Ectomorphs will typically have a hard time putting on fat or muscle. This can be a blessing in that they can eat pretty much whatever they want and will have a hard time putting body fat on because of it; but, it makes building muscle very hard. For an ectomorph, you’ll have to increase your calorie intake dramatically and remain a very high caloric surplus to put on muscle. In fact, an entire market has been created to help ectomorphs build muscle. “Hardgainer” supplements like Cell Tech and mass gainer whey complexes contain high amounts of calories and carbohydrates to help ectomorphs maintain that caloric surplus and put on muscle. Ectomorphs will take the longest to see results. Typically, beginning lifters will see significant gains of size and strength in 6-8 weeks; which can be shorter or longer depending on your diet, your training, your recovery and your body type. Mesomorphs and endomorphs can expect to see more results more quickly than an ectomorph if the rest of the variables are sufficient. If you’re lifting hard and maintaining a solid diet hitting all of your macros, most beginning lifters can expect to gain around 15-20lbs of muscle their first year of lifting. However, the year after that, the gains won’t be significant. After your first year, results will start to taper down year after year. The second gear you’ll probably gain around 8-12lbs, the third year 4-6lbs, etc. However, this is all based on an average, so you may very well gain more; but, you also may very well gain less. There is no concrete number of when you’ll see results. You can’t expect to do 3 sets of curls and have your biceps grow a certain percentage overnight – that’s just not how the body works. In fact, the process that makes your muscles grow starts a few hours after your workout, but the body has to acclimate to the muscles being broken down and rebuilt before you have any real consistency in your growth. Just because you may not be experiencing much growth right now, or you haven’t yet, enjoy this time in your fitness journey. The start is the most fun because once you get going and stick with it for a little over a month, the results start coming in quickly and you can see your hard work pay off before your very eyes. Starting out is also when you can really refine you technique and experiment with all sorts of workout programs and training methods to find out which works the best for you.